Many years ago when film was plentiful and Polaroid made film for my médium format RB-67 I used to peel the photographs from my Polaroid back and throw them away. 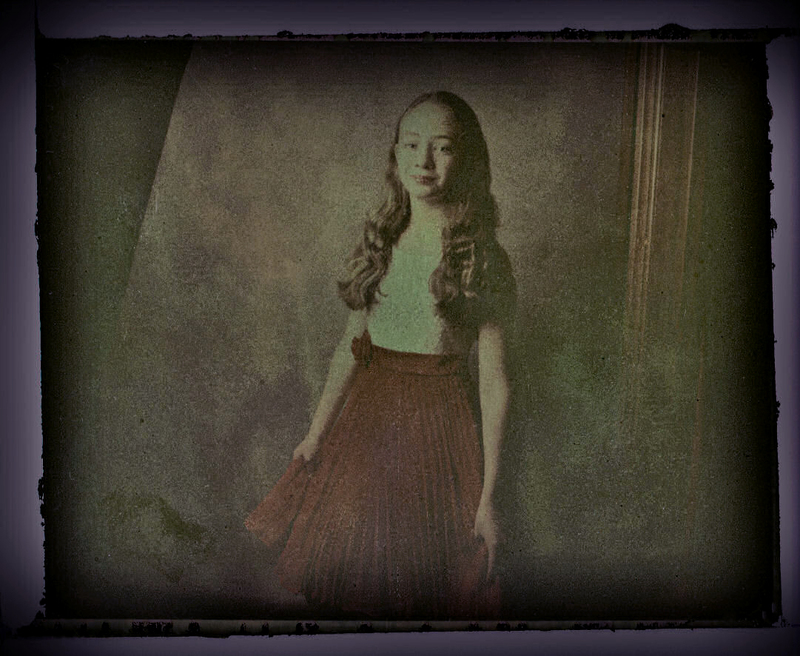 Photographers have a way of not following rules so soon a few had found out that the peels (they were negative-like) of Polaroid Colour Instant Film did not fade and that they could be scanned. It seems that Polaroid peels (as I call them) were in wait of a technology (scanners) that made them relevant and in many ways quite beautiful. Polaroid Instant Film (not the Instamatic kind) is dead. For a few years we photographers switched to unusually good Fuji Film FP-300B B+W and FP-100C Colour. 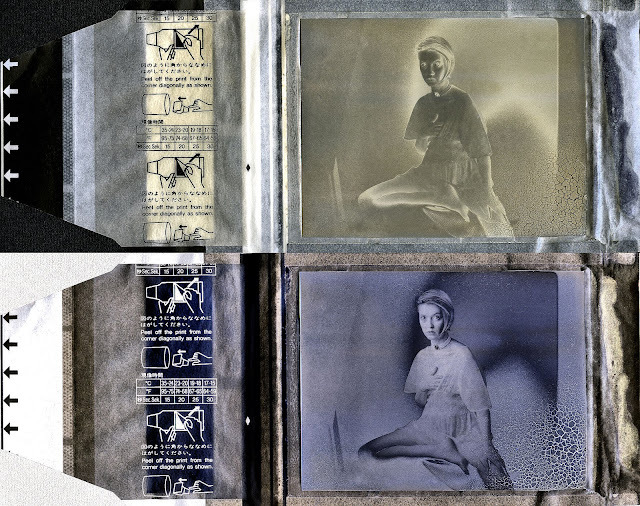 The former now discontinued produced negatives that partially solarized. The scanning results were most interesting. The latter colour film has been recently discontinued but there are rumours that Fuji is going to manufacture it in batches. The initial problem with the Fuji Instant Colour peels is that the image fades in short minutes. I have been able to take the peel to a waiting scanner and produce a sort of Polaroid transfer (as they used to be called). 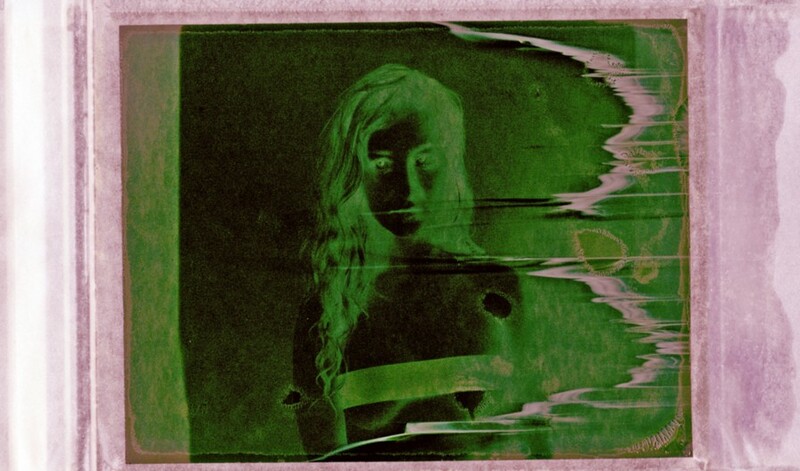 The peel itself when carefully bleached makes a strange sort-of-negative. My friend baroque bassist Curtis Daily and I compared notes on the process and have found a foolproof method for bleaching them without flaws. I have a box with at least 100 of these that now that Daily and I have our method, I will be treating in the near future. This one of Lauren is a tad underexposed but with the help of m 13-year-old Photoshop and Corel XII’s “Clarify” tool I have been able to get a lovely image of her that makes me smile when I look at it. The cello has affected me through the years sonically and photographically. I have enjoyed its sound. My mother (I do not know if she was correct) told me that the cello most resembled a human’s voice. I would have countered that a badly played oboe was a whining baby to perfection. I have photographed many cellists and strangely most women with the exception of Ariel Barnes, the Venetian Claudio Ronco (who introduced me to the music of David Popper who in many of his compositions for cello sounds like Bach on amphetamines) and (yes!) Mstislav Rostropovich. Two female cellists of note, both young, beautiful and talented have been Juliana Soltis and Marina Hasselberg. The latter has not remained in one proven genre and has branched out from her classic modern cello and baroque cello (no endpin and gut strings) to plugging it in to alternating current. In need of an excuse to place here this double whammy of a photograph I discovered and Argentine cellist who has composed an interesting piece in homage to Julio Cortázar’s hyperlink (it can be read in a linear form or in several other suggested jumbling of chapters) novel Hopscotch (Rayuela)..
Usually I blog by posting here in my Blogger blog. Sometimes I re-post it into Medium.com. The folks at Medium have a neat tool by which you can transfer the Blogger blog and drop it into their platform. In this case I have gone backwards. You might note that the formatting is not quite right. At my age of 74 (it seems I begin many of my essays in this way) and as an obsolete, redundant and retired magazine photographer I keep thinking that my interest in the photography of the female undraped woman should be curtailed. I should settle down to read, listen to music, take care of my wife and cat and plan trips to places we have not seen. And then my friend Curtis Daily from Portland, who plays the baroque stand up bass comes for a visit and I suggest we find a model and take photographs together and perhaps exchange some knowledge on the matter. We photographed this past Wednesday, February 22, 2017 Miss D who was an enthusiastic subject. I still have a few boxes of Fuji FP-100C Instant Colour film that fits my Mamiya Rb-67 Pro-SD. This film is sadly discontinued although Daily has told me that Fuji plans to make it available again by manufacturing batches of it. 1. I scan the peel as soon as I dislodge it from its print because the image fades quickly. You can see the result here before I reverse it in Photoshop. 2. In a method that Daily and I have now perfected by sharing knowledge I strip the black backing of the negative with bleach and then with careful washing a soaking I have an unconventional negative-like, but not quite negative. A. I tell my scanner it’s colour negative. B. I tell my scanner is it a positive. C I tell my scanner it is a b+w negative. What you see here are those three different versions plus a scan of the print. The excitement that this picture has generated for me perhaps urges me to keep taking photographs while I can still see and have the energy to press the shutter. You will note that Miss D has a lovely body. I photographed her by our Chickering baby grand piano. I believe I might has Miss D pose for me again. My Argentine first cousin and godmother, Inesita O’Reilly Kuker, 92 fell and broke her hip a few weeks ago. Her family is waiting for her heart to give out or for her to stop breathing. I am extremely sad as our trip (my Rosemary and my 14 year-old granddaughter Lauren) to Buenos Aires in March will not have Inesita meeting Lauren. I have been thinking of the losses of my older friends in that last few years. What I miss most about them is that they were from a generation of outgoing and warm people. I miss human warmth in Vancouver of cold rainy winters and people that I would once compared to the very cold city tap water. I look forward to my trip to Austin, Texas and to meeting up with the few friends of my generation who are left. I plant to attend Brother Rommard Barthel’s memorial service in spite of the fact he was never my teacher. We conversed long hours in my multiple stays at St. Joseph Hall, invited by that other beacon of warmth, Brother Edwin Reggio, CSC. And there is another gentleman who will be in attendance, Lee Lytton III who four years ago hosted us at his Sarita hometown and gave my wife and two granddaughters a taste of real Texas hospitality. This reunion, which may be my last ( Lytton says he plans to attend the 6th) will make me forget the rain and I will be pleasantly haunted by ghosts in the Old Main whom I know are all smiling ghosts. It wasn’t until I was 15 that I first used a phone. In my boyhood Argentina (a third world country even then) by 195,1 when I was 9, my mother bought a refrigerator from a departing American. I remember that the fridge had the compressor on the top. It was with that fridge that I made my first Lime Jell-O. Before that the “hielero” would come once a week and he would place a large block of ice in our icebox. 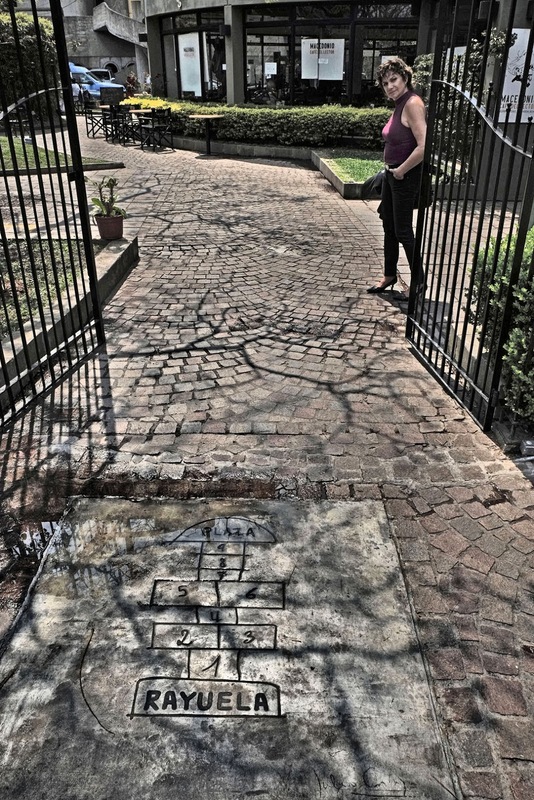 In 1953 I was invited to the house of the daughter (her name was Susan Stone) of the CEO for General Motors in Argentina. That's where I saw my first TV. She sent her father’s Cadillac to pick me up at our humble home. But it was in 1957 when I was in the 8th grade of a small one room school house in Nueva Rosita when I discovered San Valentín. 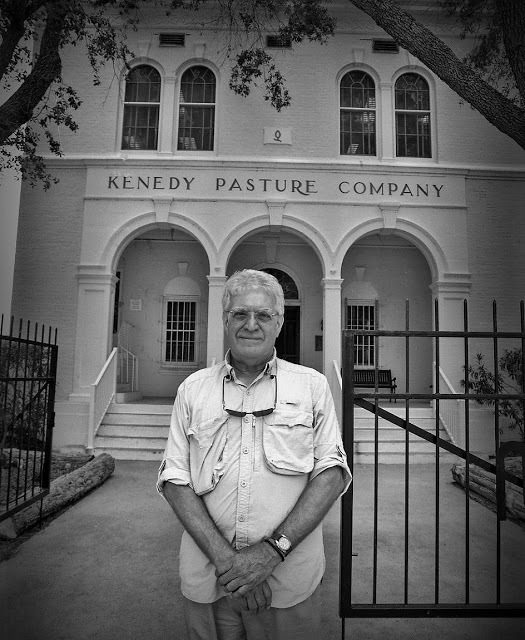 The school was were the children of the engineers of the American Smelting and Refining Company learned an American curriculum. My mother was the teacher. I hoped against all hope that the lovely Anna María Ramos who was in the 7th grade would send me a valentine card. She did but I was too shy to acknowledge it! Valentine’s was special even in my high school at St. Ed’s in Austin. It was a boy’s school but I never received a card from the cute and very short Judy Reyes who was a cheerleader. From my vantage point of the school band, where I played the alto saxophone I would sigh when she would jump at football games and reveal her underwear. Now Valentine’s day has little meaning for me. This morning I brought breakfast in bed for my Rosemary but since we do this every day it was not in any way special. Thinking on how I would illustrate this I immediately knew I would find the picture of Salem holding her heart-shaped pillow. I have a memory of my grandmother complaining about a friend she had when we were in Argentina. It seems her friend was a miser and pushy, too. She was called Valentina Perez. In my beginning darkroom in Arboledas, Estado de México around 1971 my darkroom was the bathroom in my shop. As you might imagine my shop where I had a bench saw and I made furniture which I then spray painted with automobile lacquer did not provide a dust-free environment with darkroom. When we moved to Vancouver, in our first house in Burnaby I had a splendid and very large and pristine darkroom with its own separate bathroom. In our Kerrisdale, on Athlone Street house my darkroom was a good one but it had poor ventilation. The bathroom was at the end of a short aisle. I am harping about the bathrooms because they were where I hung my wet negatives to dry. Now in my fourth (and obviously) last little home I have no darkroom. I have my colour negative film processed by The Lab. I process my b+w film in the bathroom in the upper guest room. A day ago I processed two rolls of 120 Kodak T-Max 100 Film there. They were the pictures of Deuphine. In that bathroom I have a rack where I dry my negatives. On the rack I found this Fuji FP-3000B Instant B+W negative peel of Olena, the woman with the blue hair. At one time when this film was readily available we idiots (or at least this idiot) used to throw them away. But you can do wonders with these peels if they are allowed to dry. Sometimes dust and grit collects on them. I had re-washed the peel (very carefully) and forgotten about it. Today Sunday, February 12, 2017 marks the passing of exactly 4000 blogs since I started in January 2006. When I wrote those early blogs I had no idea what a blog was or why I was doing it. I have written a few blogs on why I blog and now today looking back, what comes to mind is one of the most influential books I have ever read. It was Pierre Teilhard de Chardin’s The Phenomenon of Man. I bought it in the late 60s in Buenos Aires. 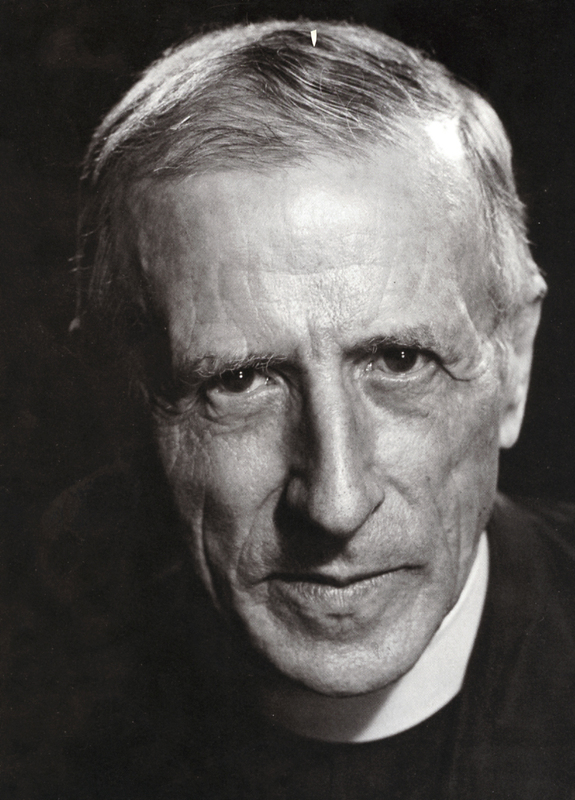 Against the background of the modern evolutionary world view, Teilhard de Chardin depicted the cosmos as a process of ascent, a series of unions. From very simple beginnings the path leads to ever greater and more complex unities, in which multiplicity is not abolished but merged into a growing synthesis, leading to the “Noosphere”, in which spirit and its understanding embrace the whole and are blended into a kind of living organism. Of late as I am plagued by en ever more complex world I do not see that Chardin rosy future. My old computer (a PC) has a 14 year-old Photoshop that works beautifully for my needs. I calibrate my cathode ray tube monitor for colour by matching it to the gray background of my web page and blog. Today when I finally was able to figure out how to download from my PC to my brand new Microsoft Surface laptop/tablet the colour was accurate and whites were whites and grays were grays. But I cannot transfer my old Photoshop. I have to (and I will not) buy a subscription and then download it. I cannot transfer my perfectly serviceable Word for the same reason. I had to pay $50 for a year’s subscription. Tell me is things are better. Tell me if this is an improvement. While I do not hark back to land lines (I have one) with dialing black phones, it seems that the improvements are just a case of making stuff more complex just to make it more complex. 1. The number was answered immediately. Odd? 2. I mentioned what a pleasure it was not to have to wait. Silence on the other side. 3. I explained the problem. I was told that he was going to talk to a supervisor. 4. He came back to tell me that he had to get into my computer. 7. I asked him to repeat that. He did. I went to the folks at Best-Buy who told me the Microsoft website that I had gone to was one they had never seen before. Tell me that things are better just because they are more complex. By the way my Microsoft Surface does not come with an operating manual. They say it is far more convenient to go for the information on line.